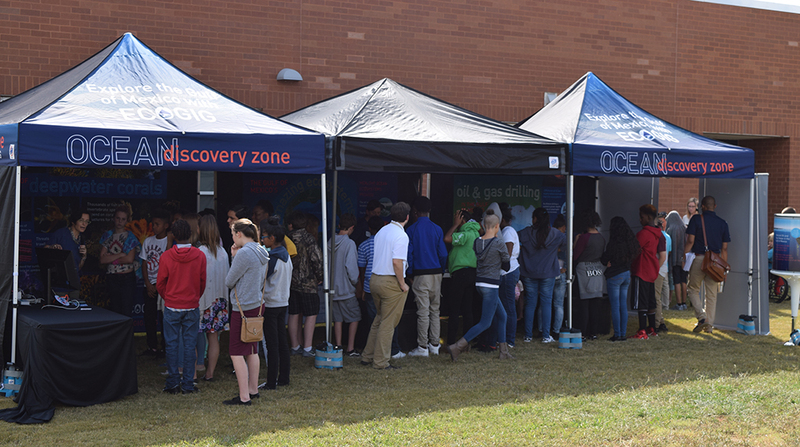 Science at the Stadium is an extension of the Ocean Discovery Zone program and is one of our signature outreach activities. Science at the Stadium was initiated in Fall 2014 at the University of Georgia and has since expanded to include other institutions from our consortium, including Florida State University and Pennsylvania State University. Non-scientists of all ages visit our booth throughout the day to meet scientists from our team, drive the model Remotely Operated Vehicles and learn about deep sea research, and earn honorary ECOGIG Pilot's Licenses. Visitors can build unique deepwater corals and tube worms, learn about chemosynthesis, see a model of a natural hydrocarbon seep, and view video content and information displays about the Gulf, deep sea exploration and the importance of a healthy ocean. 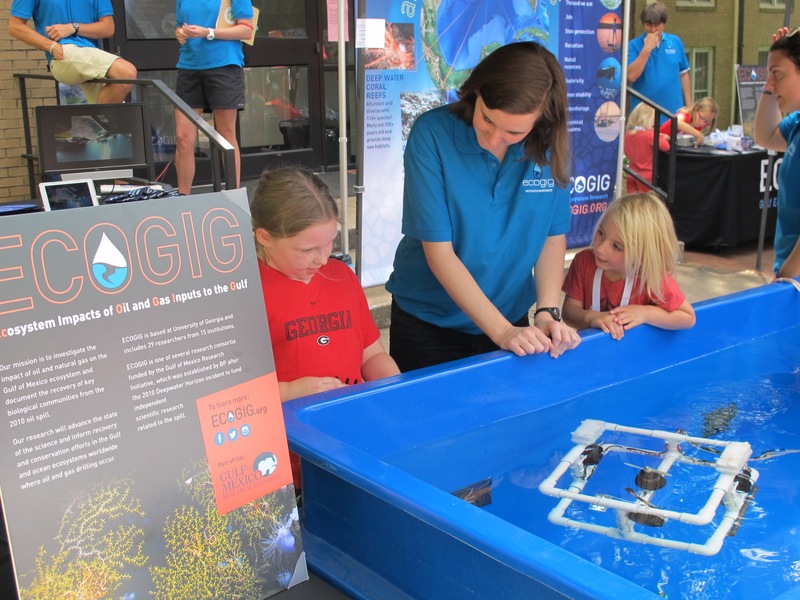 Science at the Stadium provides a great opportunity for face-to-face interaction between ECOGIG scientists, graduate students, and booth visitors about the science of deep sea exploration, its relevance, and broader impacts. Visitors have the opportunity to ask inspiring and thought-provoking questions. The Gulf of Mexico Research Initiative (GoMRI) wrote an article about this signature event - you can find it online here. ECOGIG outreach staff chatting with Penn State fans at Penn State's Fan Fest on September 3rd, 2016. ECOGIG graduate student Sarah Harrison sharing our model ROV (Remotely Operated Vehicle) with Georgia fans at our first Science at the Stadium event of 2015.